We all have rules we live by. Some of us may be more cognizant of this than others. But we all have them nonetheless. You've heard people state them out loud. I know you have. "Don't compare your insides to someone else's outsides." "Don't mistake making a living with making a life." These, and several others, are all 'life rules' I respect. And I actually employ them pretty regularly. BUT they are not the ones that have had the most impact on me. You know, the ones that literally took my breath away for a few moments when I first heard them. Like really heard them. There are 3 Life Rules that qualify for this status in my world. I live by them almost infallibly. AND today I'd like to share them with you, in hopes that they have the same profound effect on you that they have had on me. They make my life better! I want to spread that around. 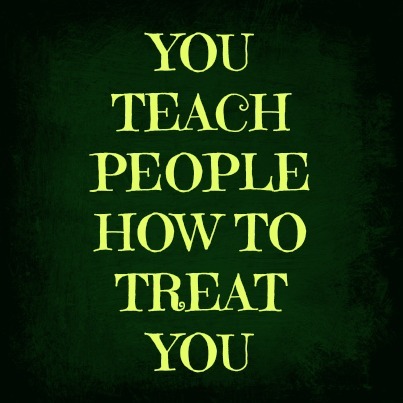 The way that you respond to how people treat you shapes their behavior toward you. If you are being treated in a way that displeases you, than it is paramount that you remember the only behavior you can change is your own. You cannot make another person behave differently. However you can certainly change the way you react to them. Don't react neutrally. And certainly don't react positively. React negatively. Remember not to 'overreact' negatively, as this will not benefit you. It simply makes you look like a bit of a jerk at worst and pretty unstable at best. Remain calm. Don't lose your patience. Voice your displeasure and move on with your day. If their behavior has 'ruffled your feathers', try to keep that under raps. It will only feed their flame. When your reaction changes, their behavior must change also. It really must. Sometimes this means that they will remove themselves from your space. AND I think that's an acceptable solution as well. Don't you? Obviously, if the situation is serious enough you will want to make removing yourself from their space the way you change your reaction. Remain calm. Don't lose your patience. Voice your displeasure (or not in abusive situations) and move on with your life. Do not maintain contact with them if they are abusive in nature. It will only feed their flame. I have used this technique in my life from the moment I was taught it. It works pretty infallibly. It is harder to employ in personal situations where behavioral patterns are already set. BUT with steadfast patience and consistent responses it works very well. I find it an invaluable life rule. I for sure couldn't live without it. We are not meant to sit back and allow life to 'happen to us'. We are creating this life, and need to purposefully choose each step of our path. I know that some of you are saying, "You don't get it, Diane. All of these things are going on in my life and I can't just ignore them. I have to deal with them. Life is happening to me. I can't just stop that. What am I supposed to do?" Choose one or two things that you want in your life. They can be large or small. Both are doable. Small is implementable. Large can be taken in small chunks. Now, do them 'on purpose'. I have been practicing this life rule for quite some time. So, I have many things in my life that I chose and implemented. As well as many that I have been chipping away at over time. My priorities have evolved over time. And a rather large portion of my current life is a result of my 'living life on purpose'. However, I recall the early days of trying to get this practice in place in my life. It wasn't easy! Once you decide to make a few things that are important to you happen, the Universe begins to assist you in ways which cannot be explained or imagined. She is faithful like that. So choose something and do it on purpose. Make it a priority. Set it right up there with the other things in your life that cannot be put off or ignored. Then choose one more. And then another. Before you know it you will be living the beautiful life you always hoped for. A life you have chosen on purpose. My life is drastically different from the first time I was taught this life rule. And it can only get better from here. It is not necessary to explain your choices or your reasons for them to others. People are only able to understand the world around them through the lens of their own experiences. If they do not 'get it' when you try explaining your choices to them, than no amount of explaining will make them understand. And exactly why are you explaining anyway? If it is because you need their acceptance, you are defeating your own purpose. You cannot obtain acceptance from someone who isn't even able to wrap their head around what you're trying to do/choose. If it is because you are simply excited about some new thought process or activity you have discovered, and you want to share it with others, than by all means share away. Share it with people who can relate to it. BUT the minute you see someones eyes go blank when you bring it up, drop the subject and move on to a conversation you can both participate in. Likewise, if you give a full explanation to someone about your interest and they respond in a way that doesn't even remotely connect to what you've just said, move on. They don't get it. People are having their own experience in this world. Each of us is here to walk our very own individual path. They do not need to understand our path. They certainly do not need to celebrate it. If you are feeling a bit disturbed by the fact that people don't 'get what you're doing', you may want to reevaluate your own perspective. Perhaps you are so wrapped up in them understanding your choice that you are not considering where they are on their own journey. In other words you are doing to them the very thing you do not want them to do to you. Ironic really. Could it be that you are the one who doesn't 'get it'? This life rule set me free in a multitude of ways. The most important thing that it brought to my life was being able to make choices without being overly concerned about the opinion of others. I choose. I implement. My decision. If someone supports my choice great. If they don't I'm okay with that. When someone who is close to me doesn't support a choice I have made I simply avoid making it part of our interactions. Simple! And that's it Witches! 3 non-negotiable life rules that are game-changers for sure!